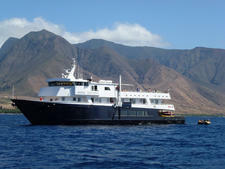 The fortunate few who choose to sail aboard Safari Quest experience the ultimate in yachting, as opposed to cruising. The pampered, all-inclusive lifestyle begins the moment you arrive at the airport and are whisked to the hotel or yacht. While you're onboard, the entire vessel is yours to enjoy, be it dropping by the bridge for a friendly chat with the Captain or sipping a cognac while soaking in the open-air Jacuzzi. 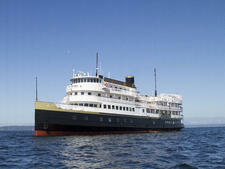 With only 21 guests -- active, well-traveled, mostly American couples in the 30- to 60-something range -- and nine crewmembers, everyone connects right away. This is a highly social venue, not a place to disappear and be alone. 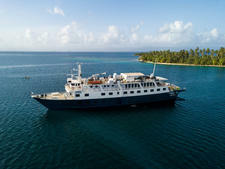 The ambiance is that of an exclusive country house party, only this movable feast cruises from scenic locale to wildlife adventure to remote native village. 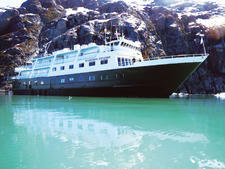 The captain maneuvers the yacht within feet of tumbling waterfalls, within yards of curious bears and as close as he can safely get to calving glaciers. 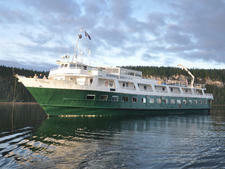 For even closer encounters, passengers explore Alaska's pristine wilderness by Zodiac or kayak. 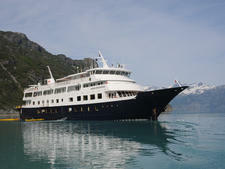 The Un-Cruise Adventures passenger is typically upscale, well-traveled and sophisticated. 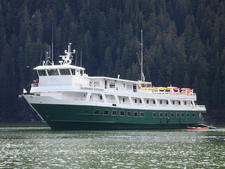 The Alaskan venue attracts an active, adventuresome 30- to 60-something group of outdoor enthusiasts. Forget the suit and tie. Casual attire, layered to match changing weather conditions works best in Alaska. Bring hiking boots, jeans, sweaters and a warm jacket. Rain slickers and rubber boots are provided. The recommended tip is 5 to 10 percent of the cruise fare, shared by all members of the crew.